Roger Penrose, Angular momentum: an approach to combinatorial space-time, in Quantum Theory and Beyond, ed. T. Bastin, Cambridge University Press, Cambridge, 1971, pp. 151–180. Available in PDF and Postscript, or as LaTeX source code. This electronic version was prepared by Georg Beyerle. Roger Penrose has given me his permission to make it available here. Roger Penrose, On the nature of quantum geometry, in Magic Without Magic, ed. J. Klauder, Freeman, San Francisco, 1972, pp. 333–354. Available in PDF and Postscript, or as LaTeX source code. Roger Penrose, Theory of quantized directions, handwritten notes, 1971. Available in PDF. 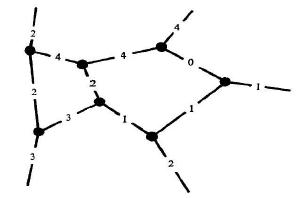 Roger Penrose, Applications of negative dimensional tensors, in Combinatorial Mathematics and its Applications, ed. D. Welsh, Academic Press, New York, 1971, pp. 221–244. Available on Louis Kauffman's website. R. Penrose, Combinatorial quantum theory and quantized directions, in Advances in Twistor Theory, eds. L. Hughston and R. Ward, Pitman Advanced Publishing Program, San Francisco, 1979, pp. 301–317. If you find typos in either of the papers I'm making available, please let me know! Various people have caught typos so far; for example, Milan Vandrovec caught a lot of them. Note: above Figure 2 of "Angular momentum: an approach to combinatorial space-time" the list of numbers "3, 2, 3" is in the original paper. This might be a typo for "1, 2, 3", although "0, 1, 2, 3" would make even more sense.